The Brazos Theological Commentary Series takes a different approach from most Bible Commentaries. Commentators are chosen on the basis of their knowledge and acquaintance with Church Doctrine over the past two thousand years. They are theologians (hence the title of the series), not necessarily historians or language experts, as is frequently the case with other commentary series. This does not mean that authors in this series are unfamiliar with the ancient languages or history, only that their expertise lies in the realm of theology. As such, they are expected to interact with the text through the medium of historical theology. Thus, in the Brazos series one will frequently see references to the great theologians and philosophers throughout the history of the Church. People like Irenaeus, Origen, Augustine, Thomas Aquinas, Luther, Calvin, and a host of others frequent the pages of this series of commentaries. This approach has its pluses and minuses. It’s fascinating, and quite often informative, to hear the reflections of these ancient theologians, as the Brazos commentator seeks to integrate their thoughts into an interpretation of the text. Depending on the commentator, however, it can at times be quite abstruse and esoteric (like the words I am using here!). With some of the commentaries in the Brazos series, I have found myself in deep water, wondering how I got there and if I would ever make it back safely to the land of biblical understanding. I must confess that with a few commentaries in this series it has been necessary to jettison them overboard because of the heavy, mind-bewildering theological freight they carry. Thankfully, that is not the case with the Brazos Theological Commentary on 2 Samuel by Robert Barron. Although Barron engages with the great theological thinkers of the ages, his commentary is clear and easy to read, while often full of wonderful and surprising insights. As I noted in a previous post (Is King David a New Adam? ), Barron’s typological/analogical approach to the David story provides some interesting food for thought. “There are some who are preoccupied with power but not necessarily with honor, and Abner seems to be such” (p. 25). “Abner evidently is not particularly interested in being king himself, but he is, like many behind-the-scenes players across the ages, deeply interested in holding the reins of power” (p. 32). “Joab is speaking in the cadences and tones of the serpent (notice the allusion to the Garden of Eden, see my previous post), unduly planting suspicion and stirring up dissension without cause” (in reference to Joab’s negative response toward Abner’s peace proposal in 2 Sam. 3, p. 35). “He is decidedly not someone who should be in a position of political leadership. He functions therefore as a symbol of the lethal violence that would plague Israel for centuries following the time of David” (p. 175). 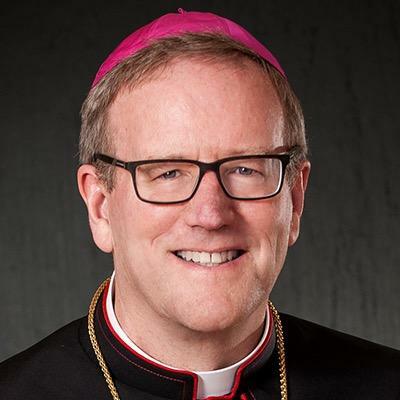 Regarding Joab’s protestations to the woman at Abel in 2 Samuel 20 that it is against his nature to destroy, Barron quotes Joab’s words and adds the response which follows. “‘Far be it from me, far be it, that I should swallow up and destroy! That is not the case!’ (2 Sam. 20:20-21). As even the most inattententive reader of this story knows, it is indeed the case” (p. 176). Commenting on Ziba’s words in 2 Samuel 16:1-4: “What becomes clear just a few chapters later is that this little speech by Mephibosheth’s slave amounts to Ziba’s rather pathetic attempt to ingratiate himself with the vulnerable king and to denigrate any potential rivals” (p. 148). Regarding Mephibosheth’s response to David in 2 Samuel 19:30: “It would be hard to construe this intervention as anything other than a sincere acknowledgment of joy and gratitude on the part of Mephibosheth and thus as a fairly clear indication that Ziba was lying” (p. 170). In my opinion, these are astute character observations on the part of Barron. Bible commentators are not always as discerning in making these finer judgments on ambiguous characters, which demonstrates his careful reading of the text. 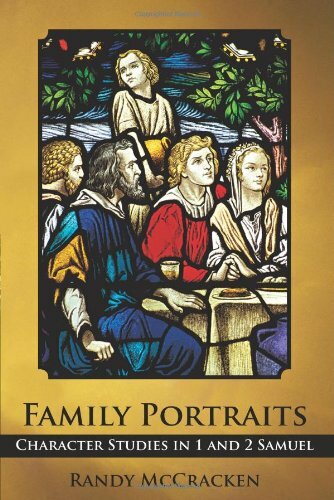 As any who have read anything I’ve written on 1&2 Samuel will be aware, I am not a fan of the school of interpretation known as “the hermeneutic of suspicion” (see e.g., my book, Family Portraits, p. 265, n. 22) which suggests that the author’s insistence on David’s innocence regarding Saul and his family is all a carefully orchestrated ruse. I am glad to see that Barron does not fall into this camp of interpretation. Regarding David’s actions toward Saul Barron states, “A somewhat cynical reading would suggest that David wanted to advertise as far as possible his warm feelings toward the house of Saul so as to hold off the suspicion that he had been actively involved in causing the death of the king. Though attractive to postmodern interpreters, such a reading, in my view, does not shed the most light. Yes, Saul relentlessly pursued David, but nothing in a straightforward reading of 1 Samuel would justify the claim that David was harboring a hidden grudge against the king” (p. 18). There are several problems with this division, no matter how convenient it might be for purposes of the commentary. It separates 2 Samuel 2 from chapters 3-4. 2 Samuel 2-4 is a unit held together by David’s kingship in Hebron, the civil war between David and Ish-bosheth, and the prominent place in the narrative given to Abner and Joab. Almost all scholars take 2 Samuel 9-20 as a unit. A second list of David’s cabinet members at the end of 2 Samuel 20:23-26 forms an inclusio with the list at the end of chapter 8, while the intervening material (chs. 9-20) is all about the circumstances that lead to various crises in David’s kingdom. (Barron seems to be aware of all of this. For example, even though he separates the story of David and Bathsheba by itself, he notes its intimate connection with chapter 12–p. 107). While all recognize that chapters 21-24 form the close of 2 Samuel, Barron’s title for this section seems a bit overstated. “Toward the Temple” may describe chapter 24, but I’m not sure how it fits with the other sections in the conclusion of the book. In spite of my criticisms here, Barron’s divisions of the text (no doubt to emphasize the theological points he sees as most important), are not detrimental to his overall treatment of 2 Samuel. Another example is in regards to the infamous Elhanan passage in 2 Samuel 21:19. Throughout the commentary, Barron speaks as if David was the champion who killed Goliath. For example, speaking of David, Barron states, “We see here the typical cleverness of the one who had outmaneuvered Goliath” (p. 49). However, when commenting on the Elhanan passage, Barron states, “What seems most plausible in point of fact is that the account in the present chapter is the correct one, and that it was later associated with the young David and retold with particular literary flare by the final editor of the Samuel literature” (p. 185). There are two problems here in my opinion. First, Barron is contradicting himself. If David did not in fact slay Goliath, then he did not “outmaneuver” him as Barron claims on page 49. Second, I have a problem with claims that biblical authors or editors embellished stories and attributed them to others. This means that facts were deliberately distorted, which doesn’t jive with a conservative (and I would argue more biblical) understanding of inspiration. Every fish has its bones, and in spite of my disagreements with some of Barron’s viewpoints, I found his commentary to be very helpful and insightful. 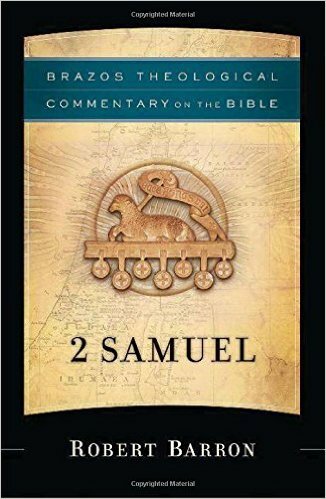 I would recommend it, not only to pastors and teachers, but also to the mature Christian seeking to grow in his or her understanding of the books of Samuel. This is one Brazos commentary that doesn’t leave you lost at sea. Thanks for the review! I read this and your previous post. I think Fr Barron’s commentary will be on my list to purchase. I do tend to agree with you that commentators sometimes are uncritical of the critics who tend to find disunities and errors where there are ways and means to reconcile different passages. Thank you again. Thanks Jose, I appreciate your comments. I’m sure you’ll gain some good insights from Barron’s commentary, as did I. God bless!